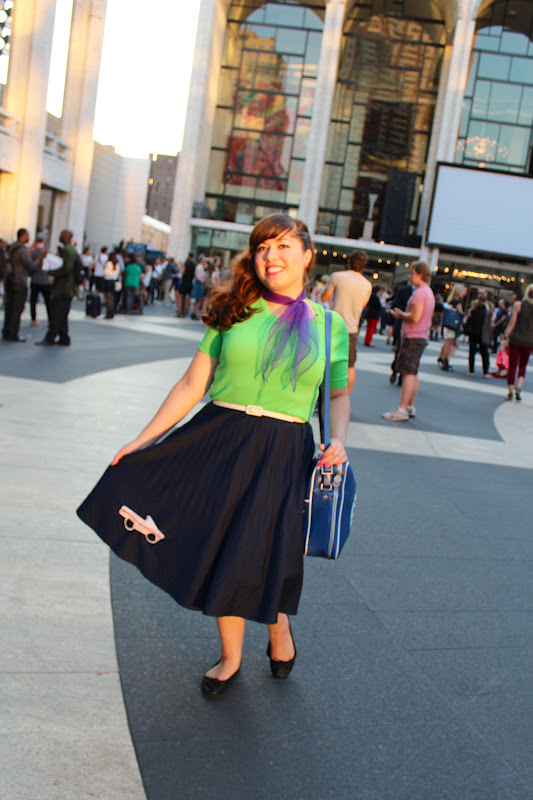 During NYFW, I ventured out to Lincoln Center to look for some unique street style, but alas, as I watched people pass by, very few piqued my interest. Thankfully, my style boredom came to a halt when I ran into my friend, Jasmin of Vintage Vandalizm. From her hair down to her toes, her look was total fifties perfection, especially those Prada sunglasses! I like that we each represented the fifties in a different way that day. Her with her pin-up bangs and me with my sock hop skirt. My look consisted of mostly vintage items, along with Topshop shoes, my Mac Jacobs Pan Am Bag, and an adorable car pin created by designer Julie Mollo.